When winter weather swirls in, nothing could be cozier than a toasty mug of mulled wine. 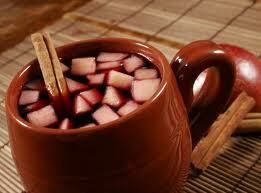 Mulled wine, the vine’s version of a classic hot toddy, is a traditional holiday treat in many Old World countries. And here I bring to you a Brazilian version . Mulled wines have been warming people for centuries, they are wines that have been sweetened, spiced and slightly heated – offering a delightful alternative to traditional coffees, and teas. This is perfect in a winter’s night !! Peel the apples , remove the seeds and cut in little squares . Gently warm all the ingredients (including the apples )on low to medium heat (avoid boiling), for 20-25 minutes. Stir occasionally to make sure that sugar has completely dissolved. PS: If you want to make it more surprising , wet the rim of the mug ,turn it and dip the rim in sugar.